The Fort Wayne Derby Girls (Ft. Wayne, IN) skated against Derby City Roller Girls (Louisville, KY). Both teams are official members of WFTDA (Women’s Flat Track Derby Association), and the first teams in their states. The teams bouted at the Memorial Coliseum in Ft. Wayne, IN at 6:00pm, February 20th, 2016. Ft. Wayne last played DCRG on June 19th, 2012. FWDG won with a score of 256 to 48. 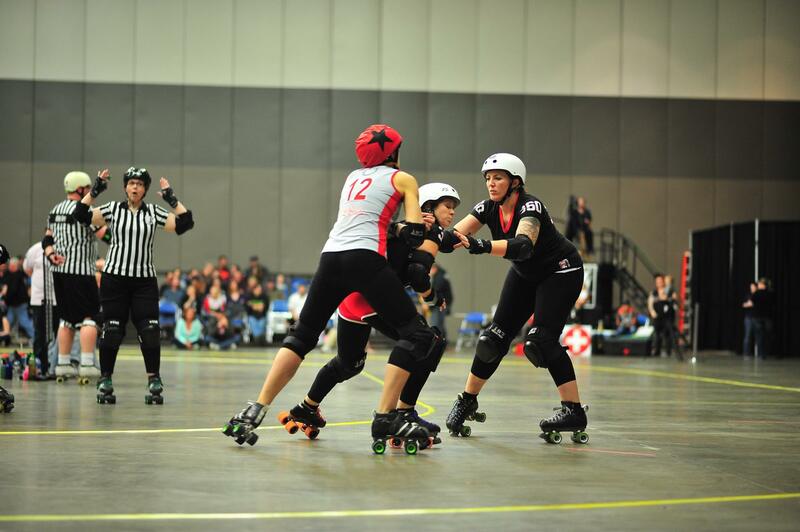 The Derby Girls were expected to win this weekend’s bout. Ft. Wayne has a WFTDA ranking of 662.4 and DCRG 602.6. ‘Flat Track Stats’ predicted a victory for Ft. Wayne, with FWDG scoring two points for every one scored by Derby City. This did not prove to be an accurate prediction. Fort Wayne took an early lead with #69 Jennie Oetting ‘Pushy Cat’ scoring several +10 point jams. FW lead DCRG 26 to 5 in the first six minutes of the game. FW held the lead but Derby City caught up by the second half of the first period, bringing the score to 28-27. The point spread does not exceed ten points during the entire first half. This is incredibly closer than expected. The score at the 30 minute half time is 73-65, FW lead. The close score seemed to motivate Derby City, who continued to score lead jammer and close the score gap. DCRG took the score lead in the second jam of the second half, 73-77. Derby City’s lead increased through the use of star passes. Making several star passes with reversible helmet covers while their jammer was in the box for a penalty. Typically a star pass is done by physically passing the helmet cover from one player to another. Derby City had reversible covers with the star on the inside of the pivot cap, which allowed them to send their Pivot through and then switch to the Jammer position while their Jammer was serving a penalty. Sierra Disch ‘Feline Frenzy’(Jammer) saw her first play 16 minutes into the second half but scored lead Jammer and quickly made two laps, scoring eight points. Bringing the score to 110-88. Impressively, Derby City held Fort Wayne at 110 points for eight minutes. While holding back the Fort Wayne Jammers, Derby City made some large gains as well, rising to 106. Fort Wayne had some strong blocking at the same time. DCRG was only able to score four points or four jams. Fort Wayne skaters were not going to lose the lead again. FW increased their lead to 126 while holding Derby City at 106, three minutes left in the bout. In a nerve-wrecking few jams the score drew to a near tie with FW leading. There was one point difference with a minute forty-three seconds to go in the game. Derby City’s #808 Brooke Hernando ‘Johnnie Knocksem’ greatly helped DCRG close the gap, taking lead jammer several times and jamming after taking some large hits. FWDG had the lead, but the final score could go either way with one final jam left in the bout. Fort Wayne sent in #105 Tracie McBride ‘Majestic’ for their last jam. Derby City’s jammer #11 Sam Fulkerson ‘Sam’ was given a penalty early in the jam leaving approximately one minute in the bout. McBride made two quick laps while her opponent was in the box. DCRG jammer left the box as McBride was passing #11. McBride knocked the jammer out of bounds and then pulled her back farther on the track. Both jammers then moved to the pack. DCRG’s jammer did make it through, with McBride being held back for slightly longer. McBride scored 7 points to bring the official final to 133-125. “We faced penalties that really affected our point spread as the primary skaters penalized were our jammers. Yet, with all of the new faces and penalties, we still pulled out a win and managed to have fun. Anytime we are successful at maintaining positive energy on the bench and having fun is a win to me, regardless of the score. I could not be prouder of the athletes on this team.” Amber Ryder O’Daniels, Coach FWDG. Fort Wayne Derby Girls are a non-profit organization. The American Society for Suicide Prevention was the official charity for February 20th. Suicide has greatly affected the Fort Wayne skating community, who lost a Tay Elzey to suicide in 2015. The American Society for Suicide Prevention raises awareness, funds scientific research and provides resources to those affected by suicide. FWDG has raised over $110,000 for local charities since 2006. 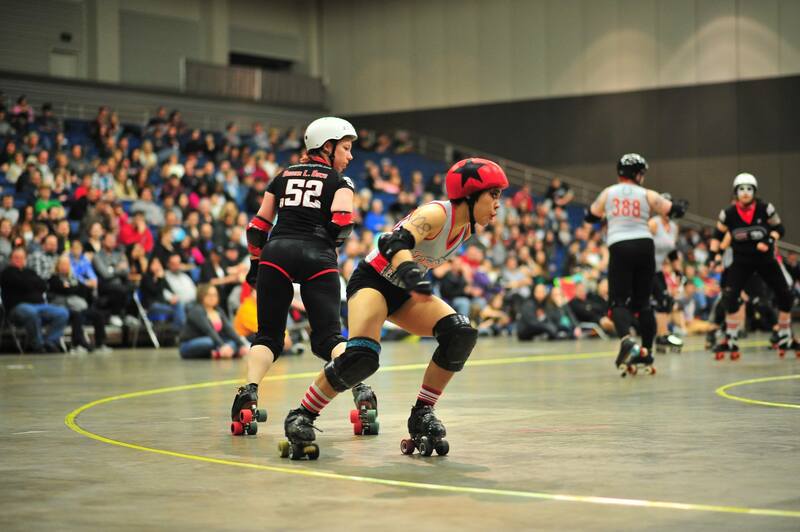 Fort Wayne’s next home bout at the Memorial Coliseum is April 2nd vs Killamazoo Derby(Kalamazoo, MI).